It's easy! 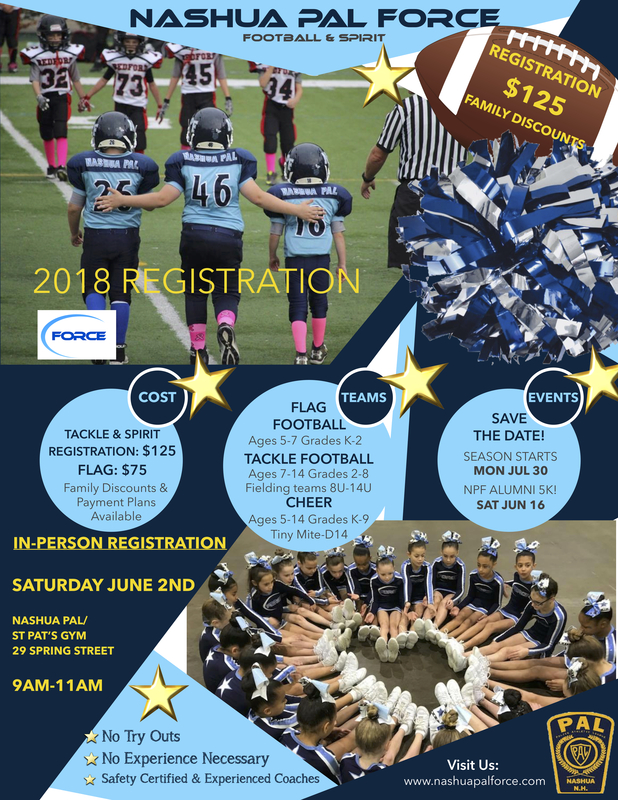 If you have a football player between the ages of 5 years (by July 31st) through 8th grade and you live in the North district (OR you live in an area that does not offer AYF/AYC football and cheer); or you are a cheerleader between the ages of 5-14 years old (by July 31st), we have a spot for you! What if my child has never played football or cheered before? That's okay! No experience is necessary. Nashua PAL Force has enthusiastic, knowledgeable coaches who will teach your child all they need to know about the sport. What are the benefits from playing football and/or cheering? Aside from the obvious physical benefits both of these sports provide in that kids will be off the couch and on the field, being part of a team sport also teaches valuable life lessons. They learn to be someone others can count on and learn to count on others. They realize how important it is to rely on your teammates and to listen to your coaches. They form bonds and friendships. They recognize the strength they gain in unity. If your child is new to the organization you will need a copy of their birth certificate, two copies of their end-of-year report card (we realize this gets turned in after the registration process has already started), a NHYFSC Medical Clearance form signed by their physician in the year in which they are playing and a signed copy of the Concussion Acknowledgement form. *Please note, the Medical Clearance Form does not require you to schedule a physical with your child's physician. The physician's office can fill out the form based on their last physical on file. In keeping with our purpose to provide the greatest number of youth with the highest level of competition, Nashua PAL Force offers the lowest registration cost in the area. Registration for the season is only $125 ($75 for Flag Football & Tiny Mite Cheer). We also offer a multi-child family discount. Nashua PAL Force is committed to fielding every level of play on our football teams. We feel this is the best team sport to play. We have the best coaches. We play at the best stadium. We have the best motivation for doing all of this....YOUR KIDS! Nashua PAL Force has worked hard to make the new and returning player registration as painless as possible. It is an evolving process and we make changes as we see the need arise. 1. You will need to register your player under our organization on the state website. 2. Visit our Forms & Documents page and open the 2018 Registration Folder, fill out the forms and bring to one of our IN-HOUSE registration dates. Please make sure you take a few moments and familiarize yourself with our organization's policies. Visit our Volunteer Page to find out more about the volunteer commitment.